Hello everyone - how's it going? Need a fun challenge to motivate and inspire you this weekend? Create a project using the photo as inspiration. Interpret the photo ANY way you'd like, just be sure to let us in on your creative process! The colors next to the photo are only suggested! * I created my card base from the Spellbinders die "Grand Nestabilities Labels Eleven"
* I stamped the sweet little faces onto my peas using the fun Erkle and Merkle Face Assortment (PK-180) from Peachy Keen Stamps. This face set is quickly becoming one of my favs! * My sentiment if from the fun Peachy Keen stamp set, Veggie Sentiments One. * I hand cut my little banner and added a couple of hearts on either side. * A bit of faux stitching with my white gel pen and all done! Thanks so much for stopping by today - I hope you enjoyed your visit. 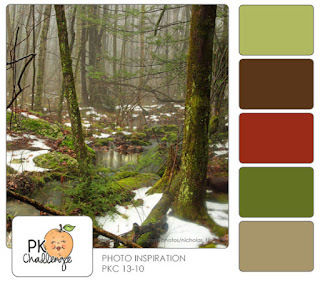 Please be sure to stop by the Peachy Keen Stamps Blog to see what the other designers have created to inspire you on this challenge - you are gonna love it! I hope to see your project linked up with us soon! Super cute card. I love it Tanya. Tanya, this is just too cute. I love the paper, the cits, the faces...every bit of it. How super adorable Tanya!! LOVE those cute stamps and your awesome take on the color challenge!!! So super super cute - love it!! Have a great weekend. Your projects ALWAYS make me Smile amd Laugh.. This is the CUTEST Peas that I have ever Seened...LOL! What sweet peas :D You perfectly followed the challenge! Love the shaped card! Tanya ~ This is such a SWEET card! The papers and the cuts are so stinking CUTE with those faces! LOVE the shape as well! PERFECT sentiment too!! As always just LOVE your creations! Have a wonderful weekend! Tanya this is adorable! I love all the detail you put into your card. I love those faces, and that sentiment is so cute, both going on my wish list:)lol. This is adorable!! Such cute little sweet peas!! Oh so cute!! Your Peas are too adorable!! This is just adorable! 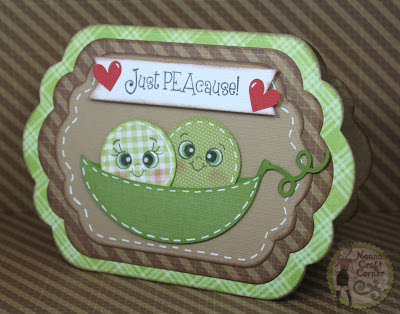 Those peas are SOOO cute with their PK faces and I love the greens and browns you used in this card! Oh my goodness...how stinken cute! Great colors, papers and awesome stitching! Gotta love those faces-so sweet! This is adorable! The little faces are darling and your stitching adds so much to the image. What a fun sentiment too! Awwwww!!! Giggle!!! Awwwwww!!!! So adorable! I really need to get more PK stamps! Seriously! Hee! Hee! EEK, these little peas are so adorable! Love your faux stitching. Sorry I have MIA lately my little man in sick :( been having a lot of mommy and peanut time ! !